I'm out of here until January 3rd or so. A nice, long well-earned rest. 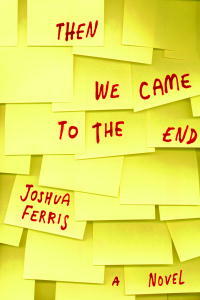 I leave you with a longer post until then - please check out the excerpt from Joshua Ferris' lovely forthcoming novel Then We Came To The End. It's been a terrific year - I finished my novel, found an agent for it and, most importantly, convinced GOTEV to become Mrs. TEV. (And I'll be hosting a great giveaway of Zoe Heller and Sigrid Nunez in a few weeks for the person who helps me come up with something catchier than Mrs. TEV.) I'm hoping 2007 will be a year of big things - at the very least, we'll have a new Michael Ondaatje novel to look foward to. I continue to marvel at the wit, energy and enthusiasm you all continue to share with me. Thank you for all the emails, the comments and the support. Three years on, this is as much fun as ever. Back in June at BEA, I had a meeting with Reagan Arthur, an editor at Little, Brown who was an early supporter of the Litblog Co-op. (She's also a MOTEV fan, which always counts extra around here.) I asked her what she was particularly excited about and she handed me one book - Joshua Ferris' novel Then We Came To The End. This one, she told me enthusiastically. I love this book, she said. And so it went into my bag - along with about 30 other BEA titles. When I got home it went from suitcase to bookshelf, and there it sat until December. In the intervening months, I picked up the book a number of times and thumbed through it. But I was stopped by a pair of prejudices. The author has an MFA from UC Irvine, and we all know how I feel about that. And the setting - office cubicle life - didn't exactly whisper to me. But I trusted Reagan's taste, so I hung on to the book and kept returning it to the shelves. Those shelves finally reached critical mass here in November and, even though I purchased another book case, it was time to purge. I began pulling off books for donation, making my peace with the fact that I would never read them. And I came once more across Then We Came to the End. Which nearly came to its end in my outgoing pile. I couldn't do it, and so I sat down and decided, "I am going to read the first twenty-five pages of this and then, only then, if I don't like, it's gone." A hundred pages later I was still sitting there. I kept reading, kept worrying that the promise wouldn't be fulfilled. But I finished the book in three or four sittings. And although one book might not be enough to prompt me to completely reevalute my stance on MFAs, it's a book that's taught me the importance of keeping an open mind. Because I would have missed one of my favorite books of the year. It's set at a Chicago advertising agency at the beginning of the economic downturn. Jobs are being lost and much time is consumed trying to determine how to look busy enough to stay employed. It's a modest landscape but Ferris imbues it with such humanity that it's continually moving in surprising ways. I've been put off the "workplace" genre by the snarky condescension of The Office and Max Barry's Company, but Ferris has respect and affection for his characters. Stylistically, Ferris works from an interestingly indeterminate point of view. A weirdly shifting first person plural that at first risks being a distancing device but ends up somehow underscoring the universal nature of this workplace experience that anyone who's spent time in an office will recognize. And hovering over the whole thing is Ferris' powerful theme of uncertainty. Jobs aren't all that are on the line; lives are held in the balance, too. WE WERE FRACTIOUS AND overpaid. Our mornings lacked promise. At least those of us who smoked had something to look forward to at ten-fifteen. Most of us liked most everyone, a few of us hated specific individuals, one or two people loved everyone and everything. Those who loved everyone were unanimously reviled. We loved free bagels in the morning. They happened all too infrequently. Our benefits were astonishing in comprehensiveness and quality of care. Sometimes we questioned whether they were worth it. We thought moving to India might be better, or going back to nursing school. Doing something with the handicapped or working with our hands. No one ever acted on these impulses, despite their daily, sometimes hourly contractions. Instead we met in conference rooms to discuss the issues of the day. Ordinarily jobs came in and we completed them in a timely and professional manner. Sometimes fuckups did occur. Printing errors, transposed numbers.Our business was advertising and details were important. If the third number after the second hyphen in a client's toll-free number was a six instead of an eight, and if it went to print like that, and showed up in Time magazine, no one reading the ad could call now and order today. No matter they could go to the website, we still had to eat the price of the ad. Is this boring you yet? It bored us every day.Our boredom was ongoing, a collective boredom, and it would never die because we would never die. Lynn Mason was dying. She was a partner in the agency. Dying? It was uncertain. She was in her early forties. Breast cancer. No one could identify exactly how everyone had come to know this fact.Was it a fact? Some people called it rumor. But in fact there was no such thing as rumor. There was fact, and there was what did not come up in conversation. Breast cancer was controllable if caught in the early stages but Lynn may have waited too long. The news of Lynn brought Frank Brizzolera to mind. No, it's not your imagination. Posting has been slowing down around here, a mild case of holiday torpor and sugar coma. We'll be signing off tomorrow for the holidays with something we hope is a bit special. Until then, go and check out the Prodigal Son's return as NEA Director of Literature David Kipen signs his The Schreiber Theory today at Metropolitan Books downtown. (Give us a holler, Mr. K., and we'll buy you a candy apple if you head to the westside.) Thanks to Dan Olivas for the heads up. As usual, the gang at Syntax of Things has done an exceptional job with their 2006 Underrated Writers Project. Go by and see what dozens of your favorite bloggers (including us - we hope) have to say. Robert Birnbaum interviews our Poet Laureate, the great Donald Hall. Robert Birnbaum: How does one address the Poet Laureate? Donald Hall: PLOTUS. Poet Laureate of the United States. RB: As in the acronym for the President of the United States, POTUS? RB: The position is described as "a lightning rod for the poetic impulse" in the country—what's your take? DH: You are a figure for poetry for a while; while you are at the Library of Congress, you get asked to speak, and actually I think you have something to do with the readings that will take place at the Library of Congress. RB: You haven't been told what you do? DH: Not very much. There are a couple of fellowships that I can award, I believe small ones. And I have to choose judges for a prize—and I am going to find out. You might have your issues with the NYTBR but it has never, to my knowledge, reviewed a book that didn't exist. The paper had published an article by Lundberg late last week in which he said that Britt Marie Mattsson's book 'Fruktans Makt' (The Power of Fear), had a "predictable" plot and one-dimensional characters. But despite having appeared in publisher Piratförlaget's autumn catalogue, Mattsson had never got round to writing the novel. We've rather like the idea of ourselves as the "Prince of St. Germain" but it appears the role has already been filled by Boris Vian—novelist, poet, playwright, songwriter, jazz trumpeter, screenwriter, actor, and general scourge of anyone failing to have enough fun in Paris in the postwar era ... "
Ben Ross and Mark Bailey have signed on to write the script about jazz legend Buddy Bolden. Set in New Orleans in the early 1900s, Ondaatje's book tells the life story of Bolden, a legendary influence on jazz who inspired such greats as Louis Armstrong. According to a report in Variety, Maslansky chased Ondaatje for nine years before the author relented and approved Ross and Bailey. At a recent symposium focusing on Haruki Murakami, participants discussed how his works are received in East Asian nations and how he touches on East Asia's modern history in his novels. In South Korea, which for many years after World War II had a military-controlled government, literature traditionally functioned as the "discharge channel of politics." Because of the situation, it was difficult for Japanese literature focusing on personal psychology or daily life to win wide support in the country. This was the case even for works by Yasunari Kawabata and Yukio Mishima. But the Korean translation of Murakami's Norwegian Wood, which was published in 1989 with a title meaning "The Age of Deprivation," was a hit.